Try this quick-to-fix chili and cornbread. Lightly oil an 8-inch-square baking pan. Add hot water water to flax meal, stir and set aside. Add the vinegar to the rice milk, stir and set aside. Using a whisk or fork, whisk the flax seed mixture until thick. Mix it into rice milk and oil. Sauté the onion, garlic and tempeh in oil until onions are soft. Add the beans, tomatoes, paste, chilies, and spices. Mix thoroughly. Add some of the water. Cover pot and simmer for at least 20 minutes – the longer the better! Stir occasionally. Add additional water if the chili is too thick. Taste, add more salt or spices as needed and serve. Use pinto, black, anasazi, adzuki or kidney beans. If using canned beans, be sure to rinse and drain them. If using dried beans, soak 1 1/2 cups of beans overnight and see Bean Cooking Chart for times and methods for cooking. If you don't have a chili or Mexican spice mix, use a combination of chili pepper, cumin, coriander, cloves, allspice and oregano. 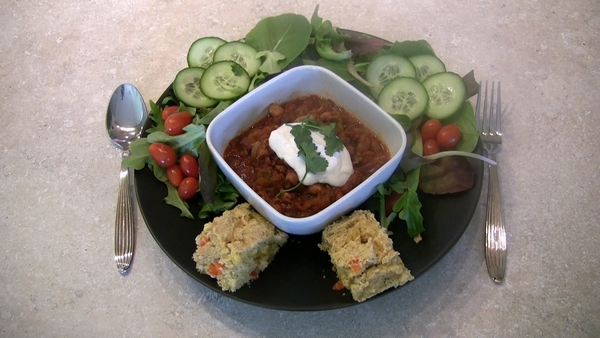 Garnish the chili with tofu sour cream and sprigs of cilantro and serve with the warm cornbread and a mixed green salad.